Fiction Matters: Talking to the Dead FREE on Kindle and all other ebook platforms!! Talking to the Dead FREE on Kindle and all other ebook platforms!! 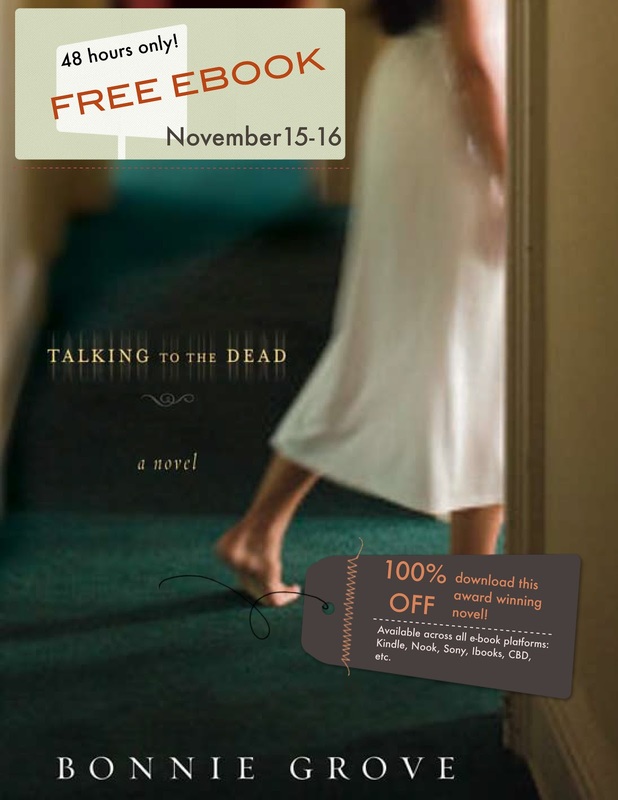 Today and tomorrow, you can download Talking to the Dead for FREE! I refused to pick at dainties and sip hot drinks. Instead, I wandered into the back yard. I knew, if I turned my head, I'd see my mother's back as she guarded the patio doors. Mom would let no one pass. As a recent widow herself, she knew my need to stare into my loss alone. Kevin had been dead three hours before I had arrived at the hospital. A long time for my husband to be dead without me knowing. He was so altered, so permanently changed without me being aware. I had stood in the emergency room, surrounded by faded, blue cotton curtains, looking at the naked remains of my husband while nurses talked in hushed tones around me. A sheet covered Kevin from his hips to his knees. Tubes, that had either carried something into or away from his body, hung disconnected and useless from his arms. The twisted remains of what I assumed to be some sort of breathing mask lay on the floor. "What happened?" I said in a whisper so faint I knew no one could hear. Maybe I never said it at all. A short doctor with a pronounced lisp and quiet manner told me Kevin's heart killed him. He used difficult phrases; aortic dissection, medical terms I didn’t know, couldn’t understand. He called it an ‘episode’ and said it was massive. When he said the word “massive”, spit flew from his mouth, landing on my jacket's lapel. We had both stared at it. Several times my mother opened her mouth to speak, but nothing came out. Our words had turned to cotton, thick and dry. We couldn’t work them out of our throats. I had no words for my abandonment. Like everything I knew to be true had slipped out the back door when I wasn't looking. "What happened?" I said again. This time I knew I had said it out loud. My voice echoed back to me off the kitchen table. "Remember how John Ritter died? His heart, remember?" This from Heather, my younger, smarter sister. Kevin had died a celebrity's death. From the moment I had received the call from the hospital until now, I had allowed other people to make all of my bereavement decisions. My mother and mother-in-law chose the casket and placed the obituary in the paper. Kevin's boss at the bank, Donna Walsh, arranged for the funeral parlor and even called the pastor from the church that Kevin had attended until he was 16 to come and speak. Heather silently held my hand through it all. I didn't feel grateful for their help. I had arrived home from the hospital empty handed. No Kevin. No car—we left it in the hospital parking lot for my sister to pick up later. "No state to drive," my mother had said. She meant me. “How far could they have gotten?” I said to myself. Without realizing it, I had stood and walked to the patio doors. "Mom?" I said as I walked into the house. She turned quickly, but said nothing. My mother didn't just understand what was happening to me. She knew. She knew it like the ticking of a clock, the wind through the windows, like everything a person gets used to in life. It had only been eight months since Dad died. She knew there was little to be said. Little that should be said. Once, after Dad’s funeral, she looked at Heather and me and said, "Don’t talk. Everyone has said enough words to last for eternity." I noticed how tall and straight she stood in her black dress and sensible shoes. How long must the dead be buried before you can stand straight again? "What happened to Kevin's stuff?" Mom glanced around as if checking to see if a guest had made off with the silverware. I swallowed hard and clarified. "At the hospital. He was naked." A picture of him lying motionless, breathless on the white sheets filled my mind. "They never gave me his things. His, whatever, belongings. Effects." "I don't know, Kate," she said. Like it didn't matter. Like I should stop thinking about it. I moved past her, careful not to touch her, and went in search of my sister. "Hey," she said, touching my arm. I took a small step back, avoiding her warm fingers. "Where would his stuff go?" I blurted out. Heather's eyebrows snapped together in confusion. "Kevin's things," I said. "They never gave me his things. I want to go and get them. Will you come?" Heather stood very still for a moment, straight backed like she was made of wood, then relaxed. "You mean at the hospital. Right Kate? Kevin's things at the hospital?" Tears welled in my eyes. "There was nothing. You were there. When we left, they never gave me anything of his." I realized I was trembling. Heather bit her lower lip, and looked into my eyes. "Let me do that for you. I’ll call the hospital—” I stood on my tiptoes and opened my mouth. "I’ll go," she corrected before I could say anything. "I’ll go and ask around. I'll get his stuff and bring it here." Heather cupped my elbow with her hand. "You need to lie down. Let me get you upstairs, and as soon as you're settled, I’ll go to the hospital and find out what happened to Kevin's clothes, okay?" Fatigue filled the small spaces between my bones. "Okay." She led me upstairs. I crawled under the covers, as Heather closed the door, blocking the sounds of the people below. I realize that I am commenting on an older post, so you may not even read this. But in the event that you do--I read your book when it first came out, and I congratulate you on your success. As I browsed through old posts and reread this excerpt just now, your words touched me deeply. We recently lost a young life through a tragic accident, and everything you describe--the bewilderment, anger, aimless living, haze of days and nights, focus on little details--it`s all so real. And that makes me think two things: either you have hyper-sensitive sympathetic juices and an uncanny gift for right words; or you know this pain, `cause you`ve been there. If the first is true, then you are conquering the craft of writing. If the second is, then I`m sorry. thanks for this comment. I'm sorry for your loss and I wish you peace through the darkness. And I gratefully accept your condolences.